The main difference between both of them is that the Credit Card Act of 2009 does not apply to Credit Card for Business, but it benefits the personal credit card users. This means interest rates can change frequently and without notice with credit card for business. That’s a big drawback if you consistently pay back interest on your purchases. By law, personal cards have their fees and interest rates covered. When you apply for business credit card, the bank will check your credit score before issuing a card; it can be from all three credit bureaus: Equifax, TransUnion and Experian and it will increase your hard inquiry and lower your credit score. In case of the personal credit card, the bank will issue the credit card for business to an individual, and he will be liable to all debts so be careful when you’re using a Credit card for small business. Credit cards for business :are a great funding option to help your company meet temporary cash-flow gaps. It can be used to build credit, streamline expense reporting and it will also help managing your employees spending. Using the credit card for business can actually give you massive financial benefits. Small business credit cards are good for earning rewards, such as travel points and cash back, when you do business related purchases like at an inventory store. Credit cards for business are only beneficial when you’ll make a lot of purchases because you’ve to reach the introductory bonus or a reward for spending some amount of money in a specific time period. In business you have to make lots of massive purchases, and it should be purchased from a separate credit card, even if that card is a personal credit card but does not inter-mingle your business and personal expenses. Businesses are better off adhering to credit cards because work-related purchases can end up busting your personal funds and even if you use business debit card, it is also not really beneficial because it can get lost and if a thief misuses your debit card, your company could get into big trouble due to invalid purchases. If it doesn’t get caught early the thief could drain all of your business money. Use your credit card for business purchases only when you know you can pay your debts easily on time. If you will not pay of your full reimbursement amount, you’ll be paying interest on a purchase and that is even worse for your business. Pay off your balance every week to keep your balances low and increase your credit scores. This will also help you keep track of what you’re earning and what you’re spending on a more consistent basis. You can either pay it weekly or monthly. If you can’t afford to pay the full balance, make sure to pay required minimum and never miss a payment. Otherwise, it will destroy your credit record. If your employees are making your business purchases on daily basis, then it’s important to get your employee a separate credit card for business so that they can easily make the transactions without any confusion and it should be with spending limits. This will reduce the risk of unauthorized spending. There are certain benefits you can avail from the use of credit cards for business; you should be clever about these things. By researching about your business credit card rewards can save you from incurring double costs like some business credit cards offer insurance for rental cars, which means one less thing to stress over when you’re centered around your excursion for work. Grace Period means a period of 10 to 20 days after your credit bill is due, they will not charge you interest in this time span. This can save you from unnecessary interest payments. A small business credit card that offers a money back reward on all buys can be important to a private company. In case you’re ready to charge your office lease, human services protection, remote telephone bill and more to your business Visa, your spending can without much of a stretch signify ten to twenty thousand dollars or all the more yearly. Your business should have a spending limit on credit card because it’ll not end up your company into debts; spend wisely according to your paying back limit so that your credit record will not affect due to bad decisions. And the more information you can provide about your business purchases at the time of the audit, the better. So you should record every transaction on the daily basis to avoid any misconception and loses. The Credit card for business and personal use should be kept separated to maintain your business credit records. Using credit card for business can actually give you massive financial benefits, but it is only beneficial when you’ll make lots of purchases. 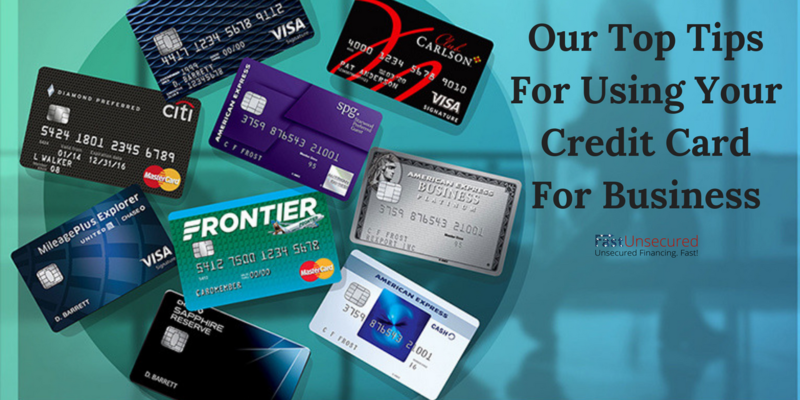 Follow the above tips for using your credit card for business, so you can enjoy many benefits from your business credit cards. This article is for Grand Teton Professionals for FundingCEO. If you like the financial world and have high ambitions; FundingCEO has the right work from home business for you. Make money without being limited by working hours because you will earn commissions rather than a wage per hour. Please contact us at support@fundingceo.com. For Media Relations, please contact :Misty.Burrell@GrandTetonProfessionals.com​. KWs : Credit card for business, credit cards for business, Credit cards for small business, small business credit card.